l Bread and Butter Pickles-16 oz. Home > Shopping Store > Jams & Condiments Shopping Cart > Bread and Butter Pickles-16 oz. 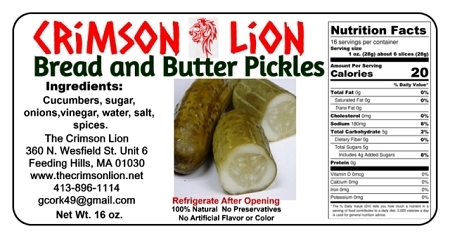 We recently introduced our Bread and Butter pickles and the following are some ideas with more to follow. Fried Pickles – Who doesn't like fried pickles?! Simply bread and fry them, Try the Fried Chicken Mix as an easy breading mixture. Smoked Salmon salad. Mix 4 ounces of Smoked Salmon, 2 tablespoons chopped Bread and Butter Pickles, 3 tablespoons aioli, and 1 teaspoon chopped dill. Serve it at room temperature. For breakfast or brunch give your eggs benedict recipe a boost by simply cutting up the pickles into smaller portions and mixing it with Hollandaise sauce. We recommend 1 tablespoon of minced pickles to every cup of Hollandaise. Put a little-aged cheddar pimento cheese on a cracker and top with a bread and butter pickle for a yummy and easy appetizer or take the same concept and make a super pimento cheese sandwich. Dice them and add to your mom's deviled egg recipe! Put a Bread and Butter Pickle on a Pork Belly Biscuit Canape for a sweet and savory mix! Click here for the recipe.